Little Ryan Family: 28 Weeks! 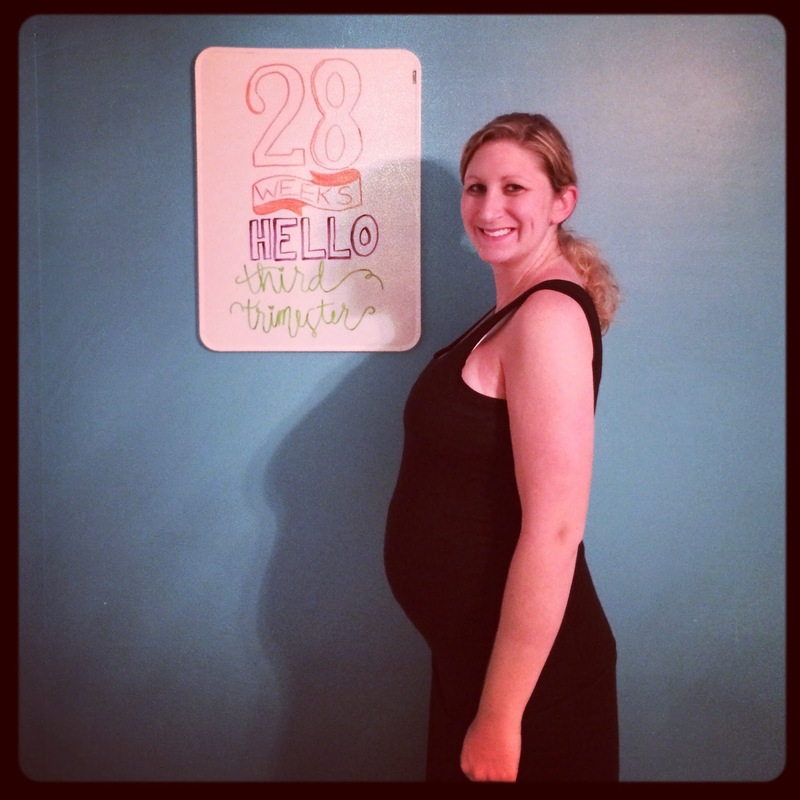 How far along: 28 Week, the start of my third trimester! Weight gain: 23 lbs. at my appointment today. Maternity clothes: Wearing maternity jeans, shorts, maxi skirts, dresses, and shirts. I still squeeze into Tim's t-shirts, but not sure how much longer I can before stretching them out! Stretch marks: Unfortunately, but I have been slathering on the cocoa butter lately to try and get them before they get worse! Belly button in or out: Starting to make it's way out. So long to my super innie belly button and belly button ring. Sleep: Aside from waking up to use the restroom once or twice a night, sleep is good. Best moment this week: Enjoying some warm weather from this past weekend, however it is a little chilly now. Hopefully it will heat up soon. Miss anything: Being able to walk around without getting out of breath and a Bud Light Lime! Movement: I think we may have a little gymnast on our hands. Tim felt her move for the first time this past week! Cravings: Cereal! It has been my go to meal/snack all pregnancy. Last week I was craving cheeseburgers like crazy but now I could go without meat again. Queasy or sick: A little tired, but other than that pretty good. Looking forward to: Hopefully passing my glucose test (I should find out the results tomorrow) and getting some more work on done on the nursery. Tim has one more coat of paint for the window and door trim. We will be getting the primed baseboards today. I got my to-do list for everything we have left to do on the nursery. I'm hoping to get the room work done before the baby shower so we plenty of room to put our goodies in. In the meantime I will have to get back to my spring/deep cleaning and de-cluttering of the house to get ready for our baby girl. Cereal is the best!!! I can't get enough of it! It's been my go to meal for the pregnancy.